In a welcome change from the piped muzak which fills most malls, shoppers at the city’s St James Centre were treated to a “flash mob orchestral procession” when members of the Edinburgh-based Tinderbox Orchestra burst into action. 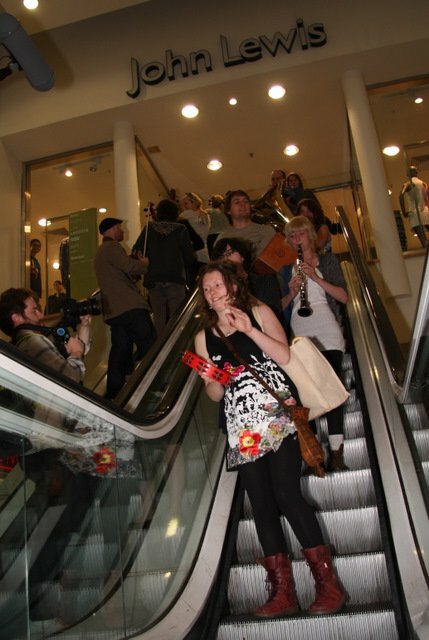 It's a novel way to hit the high notes - use an escalator! A guitarist and a trumpet player began the performance before making their way through the mall and picking up extra musicians who emerged from shops, cafes, benches and escalators. The colourful event culminated with the entire 25-piece youth orchestra busking in the shopping mall to a piece they had written called Meltdown. More than 50 shoppers joined on the end of the procession as they made their way through the centre. The students themselves came up with the idea and set about trying to put it into action, phoning around various shops in the centre to seek permission. The event raised around 300 from collections and sponsors, which will go towards putting on more events for young people and taking the orchestra to the Scottish music festival Garden Party at Kelburn Castle next month. The group later performed a number of pieces outside the main entrance of the shopping centre,including Fire by Jimi Hendrix.